I have 90+ notes in a map. I use dancing maps to rearrange my notes, but it does not work well. If I have less notes, dance works great! Could you say a little more about what “not working well” means? What happens that you would rather not happen? With less notes, the map will dance and be rearranged. The notes are separated by an appropriate distance, and the links are not overlapping. But after the number of my notes becoming 90+, when I click dance menu, the notes will only move a little distance, as little as nothing happened. 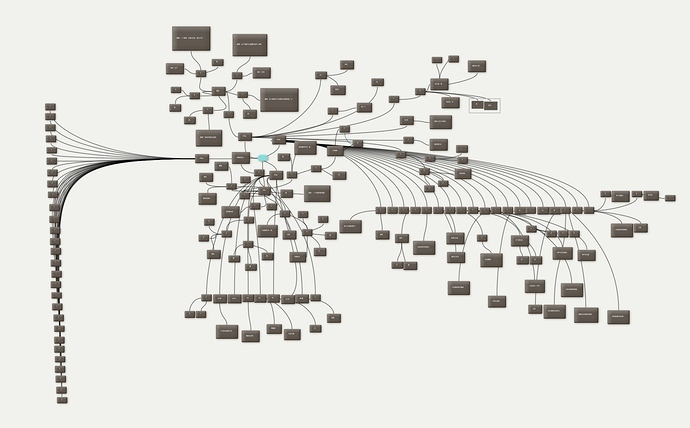 “Dancing” — the force-directed graph layout optimizer — can have lots of trouble improving some maps. There’s a famously-tangled hypertext fiction we published some years back, Mary-kim Arnold’s “Lust”, that seems to defy this and basically everything else. Sometimes, there just isn’t a good way to lay out the map! I have mailed to bernstein@eastgate.com with my document as a attachement. It turns out that the problem here was not size per se, nor intractability. The starting layout, though beautiful, has lots of very long links. Tinderbox took one look at that and said, “wow! Those are some very taught cables: if I’m not careful, they will break!” So, Tinderbox was very cautious in adjusting the layout — so cautious, in fact, that it gave up before it could really get started. We’re working on sorting this out. Is the point of dance to make some more room? I have found that I need to arrange notes into a grid before running dance, if I want it do anything significant. Looking at that map, I wouldn’t run dance on it! Because it’s already so carefully arranged. But, maybe dance is intended to make subtle improvements even to complex maps? In the next release, you’ll be able to use Dance on selected areas of the map. That might help you neaten up some of the notes near the bottom and the upper right corner, or perhaps you could disentangle some notes bear the center.